Diabetes can cause cataracts and diabetic retinopathy. Cataracts are usually easy to treat by performing a simple operation. Diabetic retinopathy, on the other hand, is a potentially blinding complication of diabetes that damages the eye's retina. 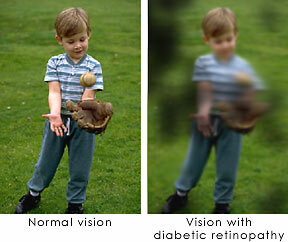 In the early stages, diabetic retinopathy does not produce any noticeable change in your vision. But it could get worse over the years and threaten your good vision. With timely treatment, 90 percent of those with advanced diabetic retinopathy can be saved from going blind. People with diabetes should have an eye examination through dilated pupils at least once a year. The retina is a light-sensitive carpet-like tissue at the back of the eye. When light enters the eye, the retina changes the light into nerve signals. The retina then sends these signals along the optic nerve to the brain. Without a retina, the eye cannot communicate with the brain, making vision impossible. Diabetic retinopathy occurs when diabetes damages the tiny blood vessels in the retina. At this point, most people do not notice any changes in their vision. Some people develop a condition called macular edema. It occurs when the damaged blood vessels leak fluid and lipids onto the macula, the part of the retina that lets us see detail. The fluid makes the macula swell, blurring vision. As the disease progresses, it enters its advanced, or proliferative, stage. Fragile, new blood vessels grow along the retina and in the clear, gel-like vitreous that fills the inside of the eye. Without timely treatment, these new blood vessels can bleed, cloud vision, and destroy the retina. All people with diabetes are at risk—both those with Type I diabetes and those with Type II diabetes (adult onset). During pregnancy, diabetic retinopathy may also be a problem for women with diabetes. It is recommended that all pregnant women with diabetes have dilated eye examinations each trimester to protect their vision. Diabetic retinopathy often has no early warning signs. At some point, though, you may have macular edema. It blurs vision, making it hard to do things like read and drive. In some cases, your vision will get better or worse during the day. As new blood vessels form at the back of the eye, they can bleed (hemorrhage) and blur vision. The first time this happens it may not be very severe. In most cases, it will leave just a few specks of blood, or spots, floating in your vision. They often go away after a few hours. These spots are often followed within a few days or weeks by a much greater leakage of blood. The blood will blur your vision. In extreme cases, a person will only be able to tell light from dark in that eye. It may take the blood anywhere from a few days to months or even years to clear from inside of your eye. In some cases, the blood will not clear. You should be aware that large hemorrhages tend to happen more than once, often during sleep. · Visual acuity test: This eye chart test measures how well you see at various distances. · Pupil dilation: The eye care professional places drops into the eye to widen the pupil. This allows him or her to see more of the retina and look for signs of diabetic retinopathy. After the examination, close-up vision may remain blurred for several hours. · Ophthalmoscopy: This is an examination of the retina in which the eye care professional: (1) looks through a device with a special magnifying lens that provides a narrow view of the retina, or (2) wearing a headset with a bright light, looks through a special magnifying glass and gains a wide view of the retina. · Tonometry: A standard test that determines the fluid pressure inside the eye. Elevated pressure is a possible sign of glaucoma, another common eye problem in people with diabetes. Your eye care specialist will look at your retina for early signs of the disease, such as: (1) leaking blood vessels, (2) retinal swelling, such as macular edema, (3) pale, fatty deposits on the retina—signs of leaking blood vessels, (4) damaged nerve tissue, and (5) any changes in the blood vessels. Should your doctor suspect that you need treatment for macular edema, he or she may ask you to have a test called fluorescein angiography. In this test, a special dye is injected into your arm. Pictures are then taken as the dye passes through the blood vessels in the retina. This test allows your doctor to find the leaking blood vessels. Laser Surgery: Doctors will perform laser surgery to treat severe macular edema and proliferative retinopathy. Macular Edema: Timely laser surgery can reduce vision loss from macular edema by half. But you may need to have laser surgery more than once to control the leaking fluid. During the surgery, your doctor will aim a high-energy beam of light directly onto the damaged blood vessels. This is called focal laser treatment. This seals the vessels and stops them from leaking. Generally, laser surgery is used to stabilize vision, not necessarily to improve it. 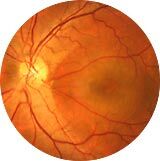 Proliferative Retinopathy: In treating advanced diabetic retinopathy, doctors use the laser to destroy the abnormal blood vessels that form at the back of the eye. Rather than focus the light on a single spot, your eye care professional will make hundreds of small laser burns away from the center of the retina. This is called scatter laser treatment. The treatment shrinks the abnormal blood vessels. You may lose some of your side vision after this surgery to save the rest of your sight. Laser surgery may also slightly reduce your color and night vision. Laser surgery is performed in a doctor's office or eye clinic. Before the surgery, your ophthalmologist will: (1) dilate your pupil and (2) apply drops to numb the eye. In some cases, the doctor also may numb the area behind the eye to prevent any discomfort. The lights in the office will be dimmed. As you sit facing the laser machine, your doctor will hold a special lens to your eye. During the procedure, you may see flashes of bright green or red light. These flashes may eventually create a stinging sensation that makes you feel a little uncomfortable. You may leave the office once the treatment is done, but you will need someone to drive you home. Because your pupils will remain dilated for a few hours, you also should bring a pair of sunglasses. For the rest of the day, your vision will probably be a little blurry. Your eye may also hurt a bit. This is easily controlled with drugs that your eye care professional suggests. Vitrectomy: If you have a lot of blood in the vitreous, you may need an eye operation called a vitrectomy to restore sight. It involves removing the cloudy vitreous and replacing it with a salt solution. 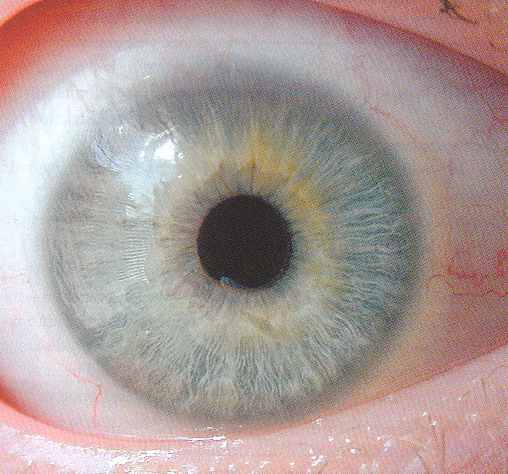 Because the vitreous is mostly water, you will notice no change between the salt solution and the normal vitreous. Studies show that people who have a vitrectomy soon after a large hemorrhage are more likely to protect their vision than someone who waits to have the operation. Early vitrectomy is especially effective in people with insulin-dependent diabetes, who may be at greater risk of blindness from a hemorrhage into the eye. Vitrectomy is often done under local anesthesia (using drops to numb the eye). This means that you will be awake during the operation. The doctor makes a tiny incision in the sclera, or white of the eye. Next, a small instrument is placed into the eye. It removes the vitreous and inserts the salt solution into the eye. You may be able to return home soon after the vitrectomy. Or, you may be asked to stay in the hospital overnight. Your eye will be red and sensitive. After the operation, you will need to wear an eyepatch for a few days or weeks to protect the eye. You will also need to use medicated eye drops to protect against infection. Although laser surgery and vitrectomy are very successful, they do not cure diabetic retinopathy. Once you have proliferative retinopathy, you will always be at risk for new bleeding. This means you may need treatment more than once to protect your sight. Many research studies in both the laboratory and with patients to learn more about the cause of diabetic retinopathy are being done. This research should provide better ways to detect, treat, and prevent vision loss in people with diabetes. For example, it is likely that in the coming years researchers will develop drugs that turn off enzyme activity that has been shown to cause diabetic retinopathy. Some day, these drugs will help people to control the disease and reduce the need for laser surgery. All people with diabetes should have an eye examination through dilated pupils at least once a year. If you have more serious retinopathy, you may need to have a dilated eye examination more often. A recent study, the Diabetes Control and Complications Trial (DCCT), showed that better control of blood sugar level slows the onset and progression of retinopathy and lessens the need for laser surgery for severe retinopathy. The study found that the group that tried to keep their blood sugar levels as close to normal as possible, had much less eye, kidney, and nerve disease.